It was lightly snowing, the kind of snow that doesn't stick but turns everything into a horrible slush. It was December of 2017. I was picking up my coworker, Raph, double parked outside his old apartment. We were headed out to Long Island. It was two weeks after I bought the car. The check engine light came on. You can probably imagine the things going through my head. You're a moron. You bought this thing and less than a month later it's crap. It's going to be expensive. Your mum told you to just take out a loan and buy a Honda. Your wife wanted a Civic, because she had one, and it was always reliable. You didn't get the Civic. You had to get this thing. You had to get rear-wheel-drive and a straight-six and a wagon and "fun." Idiot. The snow kept coming down. Raph got in the car, and immediately I blurted out that the check engine light just came on. We were headed to Tuning Works, about 48km away, to take care of a leaky valve cover gasket I knew about when I bought the car. It's the shop that does a lot of work on the wildest rides at H2Oi every year, and they've won a ton of awards. 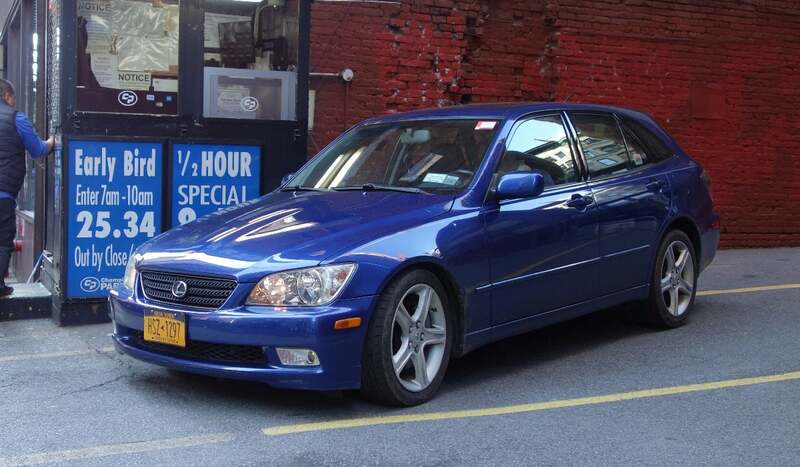 The 2002 Lexus IS300 Sportcross I just bought was going to be my baby, I decided. It was only going to get the best of the best, a model of preventive maintenance. So while everyone else was going to the nearest random mechanic they could find, I was going to the place with the awards. I'd be taking better care of this car than anyone. Because there was no way in hell I'd be caught with a check engine light. But there it was. Its amber glow was staring right at me. Unblinking, unfeeling. A yellow-orange engine with a lightning bolt going through it, as if to say "the whole beating heart of this machine is dead. You just bought it, too. $US10,250 ($14,134) straight down the drain." While I was rapidly filling with self-loathing and shame, Raph did his best to be sympathetic, as much as a man who had previously owned a car that had been rolled multiple times with a rusted floor pan and a shopping cart wheel for a gas pedal could be sympathetic over a CEL. "It's probably fine," he said. It probably was fine. I'm a completely inept mechanic, but I knew that the only major lights you had to worry about in a modern car was the oil warning light and maybe, maybe, the temperature warning light. If those things are blazing or flashing at you, it's a short time before you get permanent damage, so you better pull over quick. Almost everything else could be fixed eventually. A check engine light is usually nothing too much to worry about, but in that moment, having just bought the thing, it might as well have been dead. And even then, a check engine light is woefully inadequate. I had paid for a pre-purchase inspection at a Lexus dealership before I bought the car, and that came back pretty much perfect. So in my hubris, I neglected to put an OBD-II reader in the car that could immediately tell me what was wrong. I started running through worst-case scenarios, most of which involved conjurings from my wildly overactive imagination of the engine exploding or all four wheels simultaneously falling off. The guys at Tuning Works replaced my suspension bushing, while I fidgeted in their waiting area. They kindly reassured me that they'd check the CEL, and not to worry. They'd tell me what was wrong after they finished everything else. It felt like days, weeks. It was probably only an hour or two. But when Rich from Tuning Works finally emerged, he told me it shouldn't be anything to worry about. The computer was spitting out code "P0440" — the emissions evaporation control system. Essentially, somewhere along the fuel system, gasoline vapors were slowly drifting away. I mean, they shouldn't be drifting away if everything was operating normally, but this little issue wouldn't kill anybody. My car wasn't going to explode. The wheels weren't going to fall off. It was probably just the fuel filler cap. Replace that and the light should go away. I was grateful for the advice, much in the same way my rabbi growing up told me I wasn't going to be immediately smitten by God for occasionally tasting bacon. A small fix and everything should be fine. Of course, it was only probably the fuel filler cap. If I wanted to know definitively, that would involve a smoke test, which would cost more money, because of the labour. Rich offered, but I declined. It was a fuel filler cap, who needs more testing? Tuning Works cleared the code, my valve cover gasket was fixed anew, and off I went. I bought a new filler cap at Autozone on the way home. The check engine light was dark. My momentary panic was gone. Everything was good. Three weeks later, the light turned on again. I went and checked the code. Again, P0440. The evaporation emissions control system. Whatever. It was probably because I got an aftermarket fuel filler cap, not an OEM one. Another trip to the Zone, and I popped the $US8 ($11) cap off, and slapped on a $US22 ($30) fuel filler cap, right from the original manufacturer. All problems in the world go away if you throw enough money at them. That's just a rule of life. Three weeks later, again, it turned on again. The check engine light was no longer staring at me, unblinking, unfeeling. Now it was taunting me. I'd clear the code, and it would disappear for a little while. It would always come back though. Sometimes two weeks would go by, sometimes three. But it was there. I would clear it just to get a momentary peace of mind. Maybe, with it temporarily turned off, I could convince myself that my new-to-me car wasn't broken, that I wasn't an idiot. But of course, I couldn't. Months would go by, and I could never quite fall entirely in love with the car. A car that, to me, was lovely in every single way except for one. It was torquey and quick and it had a straight six and wonderful hydraulic steering and it was a wagon. And it had a check engine light. It was splendid and great and wrong. It was Zinaida Serebriakova's At the Dressing Table, if the table had just a little bit of vomit on it. I started searching for what could be causing the P0440 code on the internet. The fuel filler cap, the mostly likely cause, I think we could rule out. But if it wasn't that, it could be anyone of a number of things. One person on a Lexus forum got the code when they parked their car for a while, and mice chewed through a hose. Others had problems with something known as a Vacuum Switching Valve. Leaky fuel tanks. Parts that some other mechanic had worked on but hadn't installed properly. The one I dreaded most was one that also seemed endemic to the first generation of the Lexus IS300. People on the forums consistently lamented a failure in something known as the "charcoal canister," which is pretty much what it sounds like. A little canister filled with activated charcoal that absorbed any vapors from the fuel system. The other possible problems on the car I could probably fix myself, with a limited set of tools in an apartment building garage. The charcoal canister, on the bottom of the car towards the back, I could not. At the very least, the car probably needed to be on a lift. I don't have a lift. Worse than that, the charcoal canister was pretty much the most expensive part in the entire system. A hose is a hose, but a charcoal vapour canister could cost nearly $US500. Most people with the same problem said that they spent nearly $US1,000 getting it fixed. I didn't want to spend that much. I have lots of other things I'd like to spend a grand on. So I just sort of ignored it. I stopped clearing the codes. Every time I'd get in the car, that little light was there, a constant reminder of my own failures. And who among us, in this day and age, doesn't live with one of those? Mine just happened to be on my car. I knew I had to get it fixed at some point. The "at some point" was actually pretty definite, too, since I had read that a car couldn't pass a state emissions inspection in New York with a check engine light such as this one. I had until December 2018, one year from when I bought the car. I kept driving with it. I road-tripped the Lexus to New England, and to Pennsylvania, and to my mum's and my dad's and my aunt's and my uncle's and to the grocery store and to work and to car shows and everywhere else people drive. I take the subway to get to work, and occasionally drove press cars for work, so I only put on about 11,000km on it during the first year that I owned it. For 11,000km, I just lived with the light, looking back at me. With December and an upcoming state inspection approaching, though, I knew it needed to get fixed sooner rather than later. I'm not sure I even cared about the upcoming state inspection, to be honest. I just wanted that unblinking light gone. This time, I didn't drive all the way out to Tuning Works. I was tired. I went to the shop two blocks from my apartment. The people in there are friendly, and it's open 24 hours, seven days a week. It was a Sunday morning, 8 AM. I pulled the car into the garage, and told them I needed a smoke test. "That'll be $65," they replied. I paid it. I didn't care. I needed to be sure. I watched through the glass window of the shop's waiting room, into the mechanic bay. I saw them put my car on a lift, then poke and prod all around the area where the fuel tank was. After about an hour, the mechanic came over to me. He had that look and that walk and that tone that doctors use when they give you bad news. He was blunt but with a tinge of sympathy. It was the charcoal canister. And because I had insisted on a rear-wheel-drive car, it was going to be even pricier. A front-wheel-drive car, he explained, could have the job done in 30 minutes. But a rear-wheel-drive car would be longer, with much of the fuel system in the rear along with a differential and a driveshaft and all that comes with it. Two or three hours of labour. The total cost estimate was $US750. That's a good chunk of change less than the $US1000 I thought it would cost, but still, it would hurt my wallet. But weirdly, I almost didn't care. I wasn't paying for a charcoal canister and three hours of a learned man's time. I wasn't even paying for peace of mind. What I was buying was no check engine lights, no constant reminders, no unceasing light getting in between me and rear-wheel drive and a straight six and a wagon and fun, satisfying fun. I was paying for the ability to finally, finally, fall fully and deeply in love with my car.